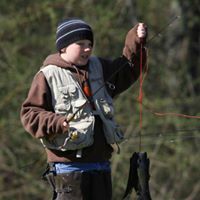 Bring your children (12 and under) to Crooked Creek Equine & Recreational Trail on June 2 from 8:00 to Noon for Free Fishing! No license required for the kids. Free prize drawings held throughout the morning. Kids get free lunch beginning at 11:00 a.m. in the concessions area. The event is hosted and sponsored by the Virginia Department of Game and Inland Fisheries. Directions: From I-77 take exit 14 (Hillsville/Galax EXIT) go west on HWY 58. Continue approximately 3.0 mile to Rte. 620 (Forest Oak Rd.) on the left. (If you pass Harmon’s Western Wear and Outlets on the right, you have gone too far.) Follow Rte 620 and Crooked Creek Wildlife/Game signs to parking area on right. The Crooked Creek Equine & Recreational Area Trail is a multi-use trail for biking & hiking enthusiasts, nature watcher, and fishermen. One of the first of its kind in Carroll County, this trail uses county roadways for its trail system. Hikers & bikers can enjoy the other trails throughout the 1,800 acre preserve.